I am used to grim weather on my birthday, but today’s meteorological maelstrom has been especially miserable. Yet out in the Atlantic on the Isles of Scilly delicate, highly-scented narcissi have been blooming since November. 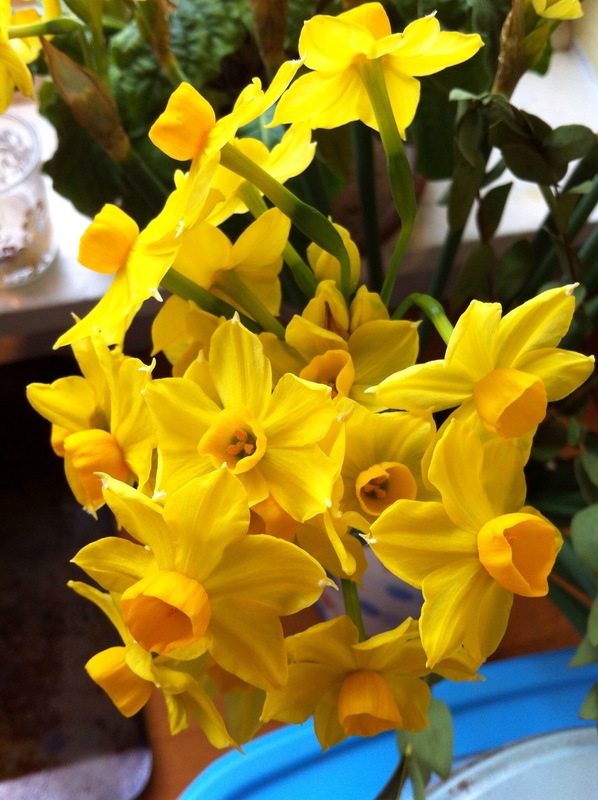 They begin with the multi-headed Tazettas, including these cheerful Narcissus ‘Soleil d’Or’ which I sent to my sister on the birth of baby Martha. Around 90,000 cardboard boxes of flowers leave the islands every year by Royal Mail boat, then by air to Land’s End and onwards to fill the homes of lucky recipients with the heady scent of spring. I know! They fill a room with scent in no time. I might try growing these alongside traditional paperwhites next year. Happy Birthday to you! and wonderful Narcissus. Thank you for your good wishes. I had a wonderful day.